Wildlands performed a wetland mitigation identification and prioritization project for Charlotte-Mecklenburg Storm Water Services. The primary goal of the project was to identify wetland restoration and preservation sites within the 524-square mile county area that may be used to provide mitigation credit to the City of Charlotte’s Umbrella Mitigation Bank. The site identification and prioritization process included both GIS analysis and field assessment. A project-specific scoring system was used to prioritize potential project sites. Ultimately, a summary report was developed for each potential wetland mitigation site that described the site’s existing conditions, possible constraints to implementation, and Wildlands’ recommendations for potential restoration or enhancement approaches. These reports demonstrated to City staff how each site ranked in terms of project feasibility, potential for functional lift, and the amount of possible wetland credit that may be created for the City’s Umbrella Mitigation Bank. 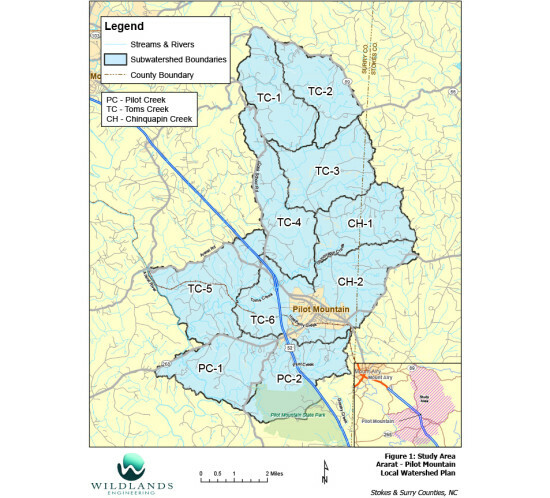 Working with the NC Division of Mitigation Services (DMS), Wildlands developed a Local Watershed Plan (LWP) for a 50-square mile area of the Upper Yadkin River Watershed in the vicinity of the Town of Pilot Mountain in Surry and Stokes Counties. The watershed study area included Heatherly Creek, which is identified on the State 303(d) list as an impaired water due to degraded biological conditions. Wildlands performed GIS analyses of streams, riparian buffers, potential wetland restoration sites, and urban stormwater best management practices (BMPs). Wildlands then developed and implemented a protocol for prioritizing the best potential project sites for stream and wetland mitigation, water quality improvements, and smaller projects that could potentially be implemented by local resource professionals through grant funding. The prioritized sites were ranked by Wildlands and DMS staff, and included in a database of potential projects and a Project Atlas. Wildlands prepared the Watershed Management Plan (WMP) which documents management strategies for the LWP area including highly prioritized project sites as well as recommendations for institutional measures. Wildlands participated in the stakeholder process with presentations and project status updates to the stakeholder group and facilitated the local urban stormwater subcommittee. 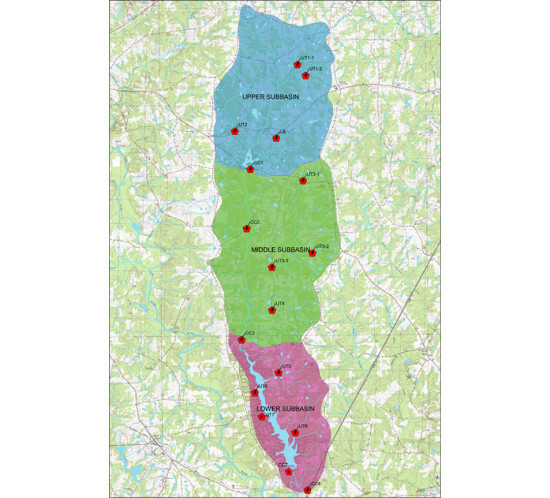 The Neuse 01 Regional Watershed Management Plan (RWP) study area encompasses 580 square miles of one of the most developed portions of North Carolina. Population growth and associated rapid development and future completion of the I-540 highway loop are major drivers for this watershed planning effort. PHASE 1: Wildlands completed Phase I of the RWP in 2014, which included a preliminary assessment of ecological and water quality conditions based on GIS data, the prioritization of subwatersheds for more detailed assessments, development of monitoring and modeling strategies for Phase II, and identification of potential watershed improvement projects, including traditional stream, wetland, and riparian buffer restoration, urban stormwater BMPs, habitat preservation, and removal of barriers to fish passage. 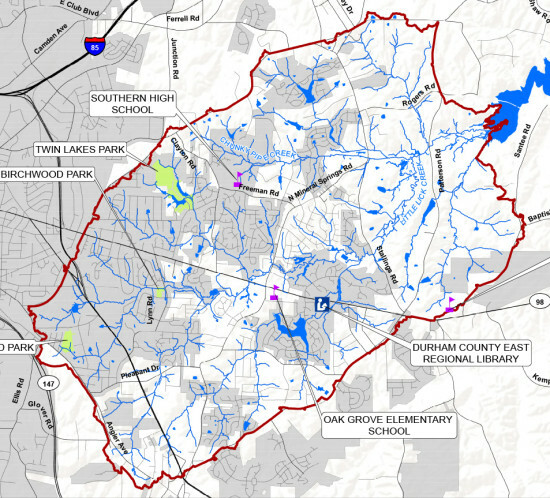 The Cypress Creek Watershed Plan involved a watershed characterization and preliminary engineering study of potential watershed improvement projects. Existing water quality, hydrology, and GIS data for the 31- square mile watershed were collected and analyzed by Wildlands. Streams were evaluated at 15 road crossings for lateral and vertical stability, aquatic and riparian habitat, and human impacts. The suitability of the channels for preservation, enhancement or restoration was determined from the data collected. The information was compiled into a GIS database. Water quality stressors were also identified within the watershed and potential opportunities for improvements, with a specific focus on structural best management practices (BMPs), were located. The potential opportunities were ranked based on planning level cost estimates, general physical and regulatory constraints, known private property interests, and political support. The watershed assessment data and GIS mapping were used to identify the BMP project that directly addressed the greatest stressor for water quality in Cypress Creek, and could serve as a demonstration site and a replicable model for other watersheds in Franklin County. A conceptual design was developed for the selected BMP.